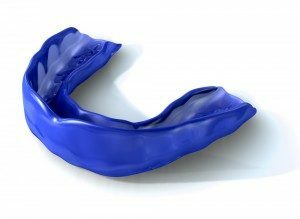 If you’re involved in any sort of sport activity where contact with another player-or the ground-is possible, you’ll want to ask your dentist about obtaining a custom-made mouth guard. Such mouth guards are affordable and last several years with good care. They are your first line of defense when it comes to protecting your teeth during sporting events. Mouth guards save teeth. Some dentists and researchers also suggest that mouth guards might protect against concussion by absorbing the shock of a blow to the lower jaw which is another good reason to wear a mouth guard. Custom-made guards are far superior to the “boil and bite” guards you’ve probably seen in your local sporting goods store. Custom guards are made using a process similar to that used when making an orthodontic retainer. Essentially, a custom mold is made of your teeth, and the resulting product is a guard that fits your mouth and teeth as well as a tailored suit would fit on your body. Did you forget your mouth guard and get a broken tooth? What do you do? Rule number 1: don’t panic. Easier said than done, but keep this thought in the back of your mind: your dentist sees this all the time, and it’s no big deal. Don’t Panic. Try rinsing your mouth with cold water, and apply a cold compress to your face to reduce swelling. Assess the situation. Check the inside of your mouth and identify the tooth (or teeth) in question. Look for the tooth or tooth fragments that may have fallen. If it was a baby tooth that chipped or fell out, do not try to put it back. Instead, put it in a safe place in case your dentist wants to see it. If a permanent tooth was affected, either preserve it in a clean container in a moist solution (cold milk, water, saliva), or place the tooth back into the socket and bite down gently on some gauze or a piece of cloth. Call your dentist. It doesn’t matter what time of day, or day of the week, Adams and Cheek Dentistry has an emergency number to call on our after-hours voicemail message. And of course you’re in luck if the tooth situation occurs during normal business hours. Let us know what happened and schedule your appointment at http://raleighncdentistry.com/contact-our-office/. If you are unable to get the after-hours emergency line, you should visit the emergency room to get assessed.